As a butterfly, a lepidopteran is a pollinator, important to the food chain; and as a caterpillar, it is a constant consumer, potentially damaging crops and deleteriously effecting our food chain. In the lifespan of lepidoptera, caterpillars live solitary lives, singled-out, existing on a lower dimension, Earth-bound; and butterflies perpetuate their species, mingled-in, existing on a higher dimension, flying the Heavens. 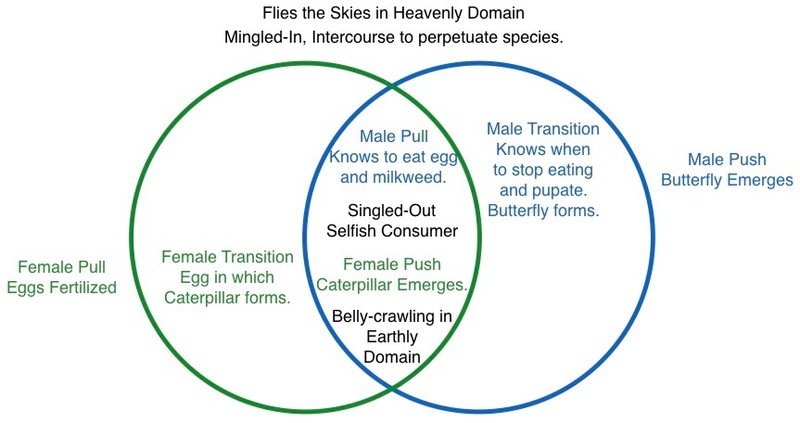 Therefore, the dual aspects of lepidoptera occur on dual domains. Between the nectar-drinking creature who flies the Heavens and the belly-crawling creature who ascends no higher from Earth than tree limbs allow, two intermediary stages facilitate transformation in either direction. 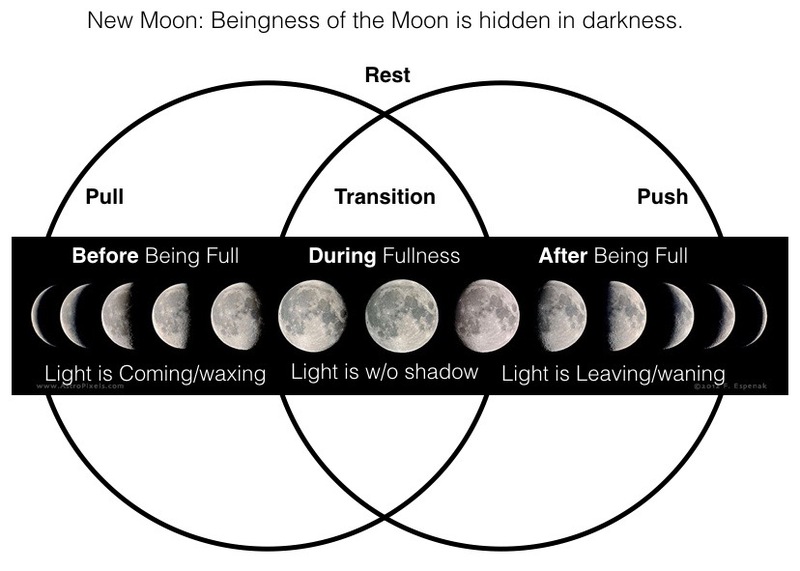 These opposite transitional stages are akin to the waxing and waning phases of the moon. The egg is an encapsulation in which a caterpillar develops, protected until ready to emerge on the Earthly plane. The egg brings the waxing caterpillar into Earthly existence. The chrysalis is an encapsulation in which a caterpillar undergoes pupation, dissolving its bodily tissues, saving only a few special cells. Within the protective enclosure of an increasingly transparent sheath, a butterfly develops from these so called ‘imaginal’ cells. Pupation wanes away the caterpillar so that the lepidopteran may achieve its highest fulfillment, the Imago. 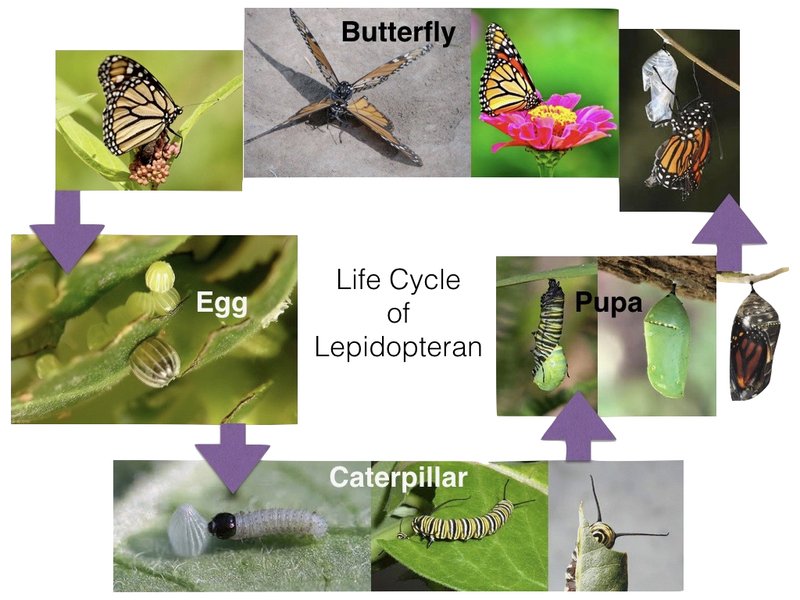 Both the egg and the pupa are the Transitional vehicles of Lepidoptera. The egg may be thought of as a portal through which the caterpillar emerges onto the earthly plane, and the pupa may, likewise, be thought of as a portal through which the butterfly emerges into its heavenly domain. Below, the phases illustrated above are spelled out across a Pragmatic Schematic. That which is visibly singled out in the lower/Earthly dimension is related to what is mingled in with the invisible higher/Heavenly dimension. The PS above allows us simultaneously to see the dual aspects of a lepidopteran’s lifespan, and the portals through which they emerge. The singled-out, self-interested, belly-crawling consumer is in the central, almond-shaped Mandorla in the image above. This area of overlap contains BOTH a Push and a Pull. The corporeal caterpillar Pushes its way out of the egg, and the critter’s consciousness spurs it to Pull nourishment, by instinctively eating its own egg shell and then going on to indulge in the consumption of its primary food source. The actions of the caterpillar, and its domain, are BOTH visible. 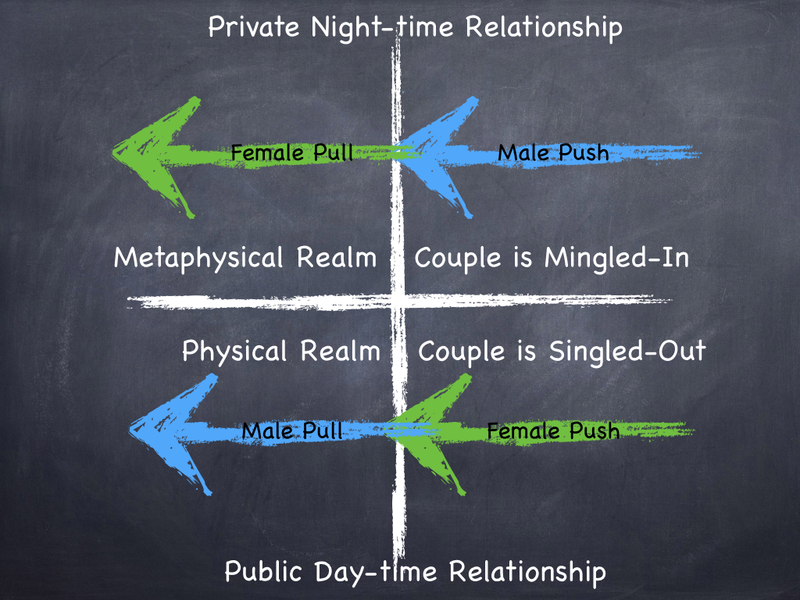 In this ‘Public Daytime Relationship’ the Male aspect Pulls and the Female aspect Pushes. The space of the butterflies’ Heavenly domain is invisible (we see right through it). Insemination is an inside job, private and also out of sight. NEITHER the butterflies’ domain, nor their life-producing act, is visible to us. In their ‘Private Nighttime Relationship’ adult butterflies mingle-in to perpetuate their species: the Female Pulls and the Male Pushes. The chapter Equivalency of Primary Models of Quadernity showed how the singled-out have a visible/physical relationship, whether depicted in the mandorla/Vesica Piscis of the Pragmatic Schematic, or in the lower quadrants of the Chalkboard Model (see below). 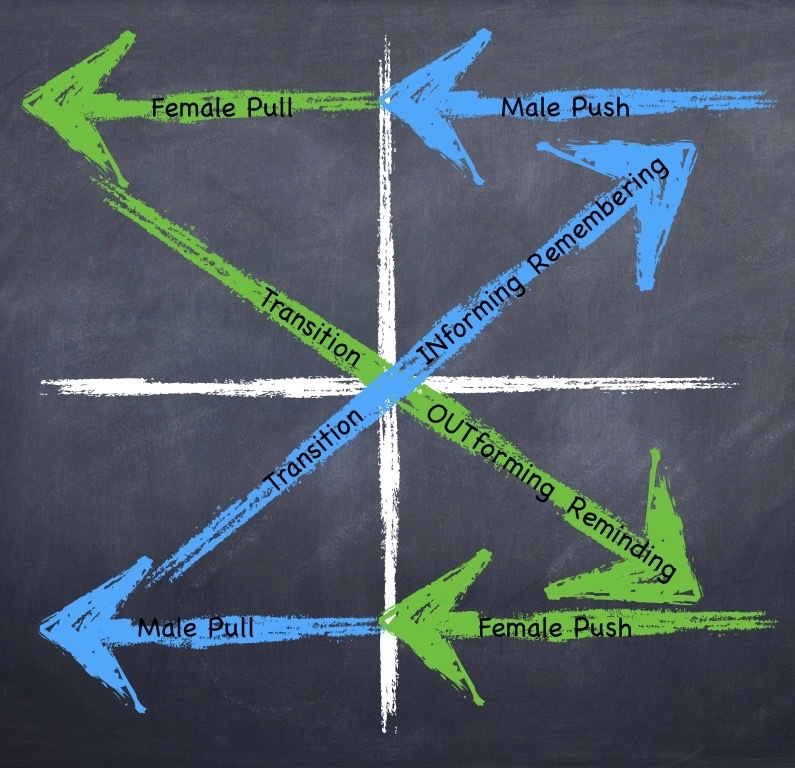 And, although the mingled-in have a hidden/metaphysical relationship, we can still depict it in either the area outside/beyond the PS or in the upper quadrants, depending upon which model is most appropriate for evaluating the situation at hand. The idea of Transitional ‘portals’ (egg and pupa) for the dual aspects of the lepidoptera aligns conceptually with the Transitions between the domains of metaphysical consciousness and physical corporeality, as we experience them in our own lives. Creating/OUTforming and INforming are inextricably-paired, inverse actions, performing as portals between the physical and metaphysical dimensions, and facilitating feedback between our complementary aspects: corporeal bodies and conscious minds. CATERPILLAR ~ teen/student striving for independence, oscillating between dependence and dependability; rapid growth and hungry appetite. PUPA ~ adult/householder/parent/provider/Participating in Partnerships, dependably puts self behind the needs of others; sacrifices for the greater good of the collective. BUTTERFLY ~ elder/spiritual aspirant/mentor/wisdom-keeper/leader, maintains the interdependent link between generations, past and future; responsible for perpetuation of the species (not simply by reproduction, but by wise leadership). A three-part video series, Imago and the Image of God, delves more deeply into this subject. You can also access it under the mastheading Presentations. In our next chapter, besides Discovering Portals between our Dual Dimensions (physical and metaphysical), we will formulate the question, mathematically speaking, as to what numerical values allow for seamless transitions between contiguous dimensions.